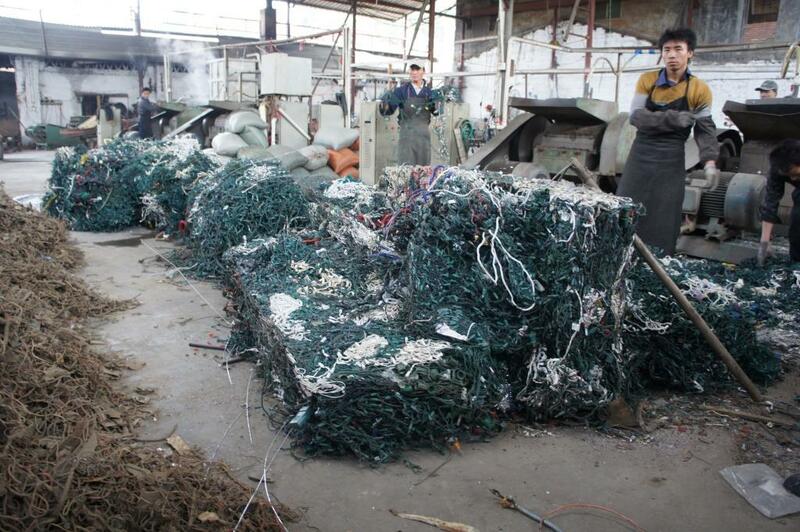 What Really Happens to Your Christmas Tree Lights After You Recycle Them? As readers of Junkyard Planet know, that’s a question that I’ve been asking since 2011, and my first visit to Shijiao, a small-town in south China that I call the ‘Christmas Tree Light Recycling Capitol of the World.’ The story of Shijiao is about more than just the recycling of Christmas tree lights. In many ways, it tells the story of how and why so much that America recycles goes over seas. Today, the day after Christmas, I have a new essay over at Time on the topic of what happens to all of that stuff leftover after Christmas: “Your Christmas Tree Lights Are Headed to China – and Then Back To You.” It’s my first essay for Time, and I’m really pleased with it. It builds upon what I wrote in Junkyard Planet – and that builds upon a piece that I did for the Atlantic in December 2011, “The Chinese Town That Turns Your Old Christmas Tree Lights Into Slippers.” That story was accompanied by a video I shot of the factory (photographed above), that you can still find here. On Friday morning, I spoke to Alex Cohen of Take Two on KPCC in Pasadena, California about Christmas light recycling. You can hear that interview here (and an interview about Junkyard Planet that I did with Take Two earlier this month, here). Finally, and much to my surprise, Walter Nicklin, publisher of the weekly Rappahannock News in Washington, Virginia, published a wonderful Christmas Eve editorial – “O Little Town of … Shijiao?” – that touches on Christmas tree light recycling and some of the themes I explore in Junkyard Planet. I hope you’ll click over and have a look. This afternoon I spent some time working on details for what’s going to be the second leg of a Junkyard Planet tour that’ll lead me to the UK. And that got me wondering if it’s going to be anything like the first leg. The thing is, before this all started, I sort of knew what was to come. Only I didn’t! Of the many surprises on the road, perhaps the most unexpected was the endless, relentless search for telephone land lines from which I could do radio interviews (and I have done a LOT of radio interviews). Here’s the deal: radio programmers hate cell phones. As we all know, they tend to break up, fade out, or outright cut out at the worst times. So, if a programmer is going to book a guest, they’ll usually require the guest to book a land line. In an age where many of us are dropping our land lines, entirely, this can be difficult. And if you’re an author on tour, traveling between locations, this can occasionally turn into a crisis. Take, for example, the photo, below. It was taken somewhere in the Midwest, at a hotel that I had thought I was booked for. Turns out that I had booked it … for a week in the future. Worse yet, I arrived five minutes before a radio interview that was supposed to patch into my (non-existent) room. 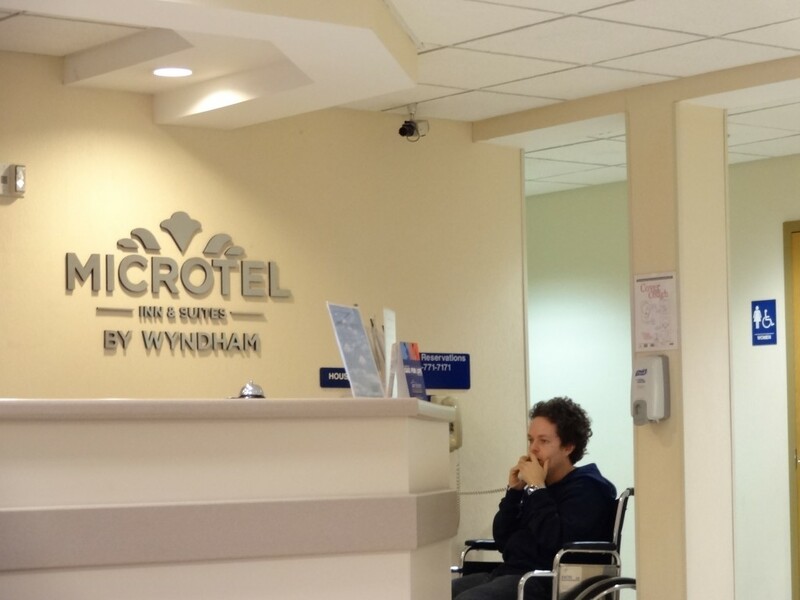 Thankfully, a desk clerk took pity and let me do the twenty minute interview on the house phone, while seated in the only spare chair available – a wheelchair. My wife captured the moment. The glamour of a book tour. Of course, it wasn’t all chaos. Mostly, it was maximum fun that ran as smooth as a well-planned road trip (which it was, in many respects). So: thanks to everyone who came to the book talks. For me, some of the most enjoyable moments involved getting to meet people who’ve been reading Shanghai Scrap over the years, following me on twitter, or keeping up with my Bloomberg work. As a writer, it’s one thing to know that people are reading, but it’s something altogether different, and better, to know the people who are reading. I’m so grateful to have had that chance over the last few weeks, and I’m looking forward to having more chances as we near the 16 January UK release and a book tour that’ll me around London, Singapore, Malaysia, and then back to China (details, as they become available, here). The Wall Street Journal published a wonderful, extended review of Junkyard Planet by Erica Greider. 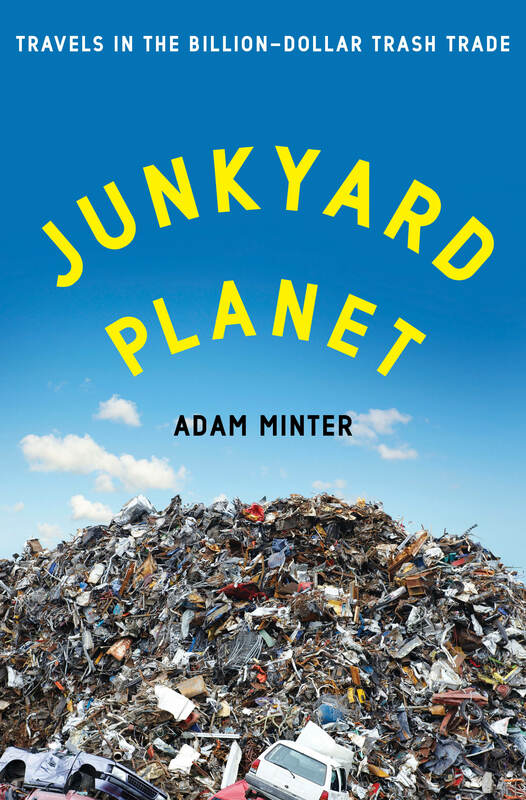 Amy Goetzman at MinnPost (a publication to which I occasionally contribute) ran an interview with me that touches on how I got around to writing Junkyard Planet. Anna Maria Tremonti interviewed me for the Canadian Broadcasting Company’s daily radio show, The Current. That last radio appearance is one of my favorites from the last month, in no small part because it sent Junkyard Planet up the best seller rankings in Canada. In fact, as I write this, Junkyard Planet is sitting in the Top 50 at Indigo (next to authors like Stephen King [!] and Donna Tartt [! ]), Canada’s leading book retailer, and is back-ordered at Amazon Canada. Thank you, Canada! At least for now, the book is available at both sites for an astonishingly low CDN$13.74 for the hardcover on Indigo, and CDN$11.09 for the Kindle edition. Those are the lowest prices I’ve seen anywhere (and they’ll last so long as Junkyard Planet is in Indigo’s Top 50), so if you’re in Canada, and looking for a trashy holiday gift for that grubber in your life, this is the moment. Happy holidays to the readers of Shanghai Scrap, and many thanks for helping to make November and December 2013 so unforgettable for me and my family. The North American tour for Junkyard Planet is over, and we’re finally back in Shanghai. The six weeks since the November 12 release have been a whirlwind, and I’m only now beginning to process where we’ve been, and all that’s happened. 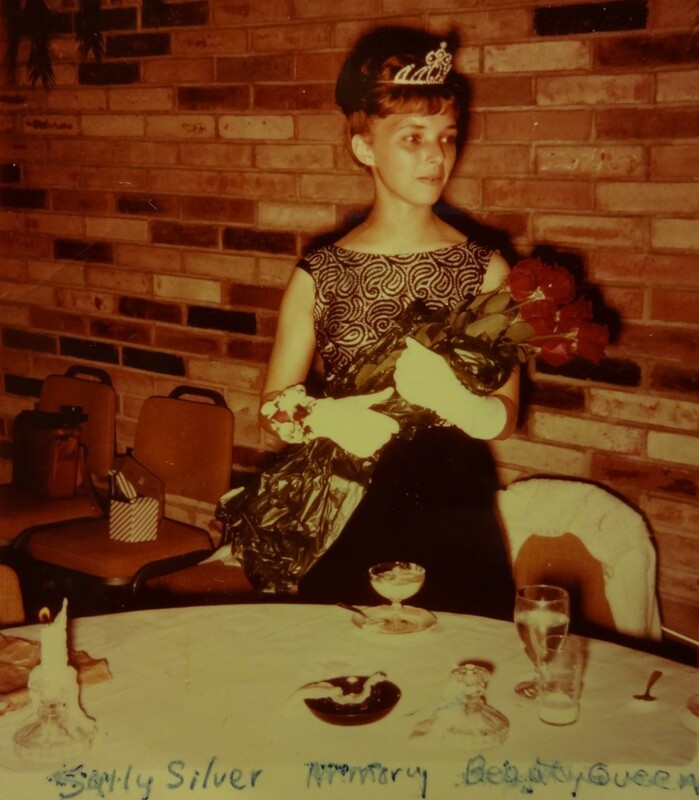 As some of you know, my mother passed away suddenly in the midst of this whirlwind. More than anything else that’s happened over the last month, that’s what has been on my mind during the quiet moments on the road. But, for those who might’ve wondered how I could continue the tour during this time, I can only tell you that she would’ve expected it. In fact, she would’ve been the first to volunteer to drive me to the airport. If you were at the reading at Common Good Books in St. Paul on November 15, she was the woman smiling through upturned eyes, front row, center. I won’t forget it. It’s been a busy two weeks on the Junkyard Planet tour. Before Thanksgiving, I had a series of appearances in the Midwest. 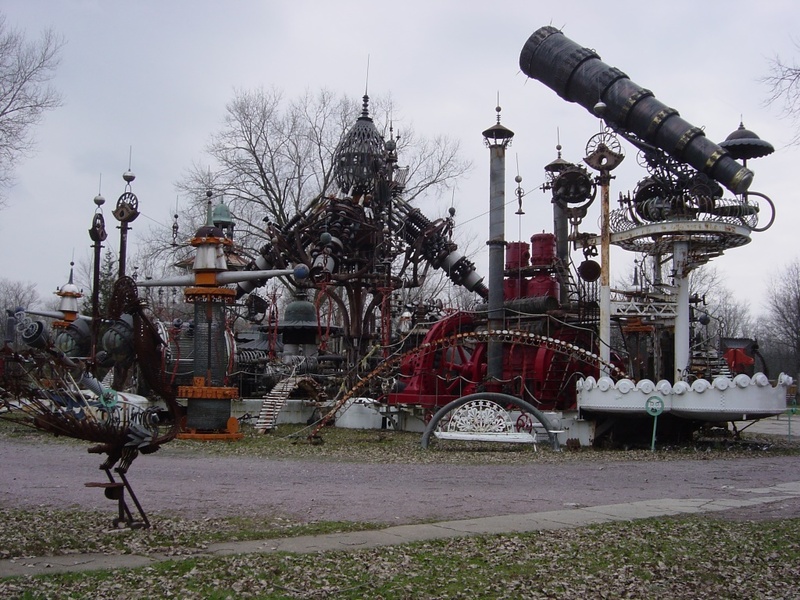 Along the way, I stopped in to say hello to Dr Evermor, the maker of the Forevertron, the world’s largest (and best!) scrap metal sculpture (something I wrote about – at length – in 2005). I’ll have more to say about that visit with Dr. Evermor in weeks to come. In the meantime – and for those who don’t know it – a photo of the Forevertron, below. As I blog this, I’m en route to Los Angeles for four appearances in Southern California over the course of the next week, three of which are listed here (I’ll post info on the fourth in the next day). The New York Times’ David Barboza conducted a Q&A with me that appeared last week in two parts, available at the paper’s Sinosphere site, here and here. WBEZ Public Radio had me in the studio to talk about recycling and consumption in an extended interview that aired on the excellent World View program the day after Thanksgiving last week. Just today, Vice Media posted a video podcast of an interview I did with Wilbert Cooper regarding Junkyard Planet when I was in New York a few weeks ago. Wilbert’s a great guy, and he took me in some interesting directions not covered by other interviewers. I really enjoyed doing it (and working with Vice!). At the LA Review of Books, Susan Jakes published a spectacular review of Junkyard Planet. To my complete surprise, Junkyard Planet made Slate’s Best Books 2013 list, staff picked edition, thanks to Joshua Keating. Finally, I’ve set up a Goodreads drawing to win one of the three signed hardcover copies of Junkyard Planet (US only, for now; international readers will get their shot in January!). Enter here to win one. Lots more to come. Thanks as always to the many friends of Shanghai Scrap who’ve kept this blog going over the years. I’m blogging from Minnesota today, a week into the Junkyard Planet book tour. Below, an image from the standing-room-only reading and Q&A we had at the fantastic Common Good Books in St Paul on Friday night. An interview with NPR’s Terry Gross on Fresh Air. A fun interview with Abe Sauer at the Awl (and if you don’t know the Awl, you should). An on-air interview with WNYC’s Leonard Lopate. An interview with The Atlantic Cities on how China became the world’s Junkyard Capital. A fun on-air interview with my friend Tom Weber at Minnesota Public Radio’s Daily Circuit show. Thanks to these appearances, and the support of many friends, Junkyard Planet went as high as #117 on Amazon’s bestseller list this week! Thanks to everyone for making that happen – and especially all my longtime readers here at Shanghai Scrap. It means the world to me. On Tuesday, November 12, Bloomsbury Press will publish my first book, Junkyard Planet. To the right, you’ll find links where you can purchase it (including for Amazon, Barnes & Noble, Books-a-Million, and Indie Bound). For those who aren’t sold, you can read excerpts at Bloomberg BusinessWeek and the Atlantic; watch the book trailer; or browse the three months’ worth of ‘Scenes from a Junkyard Planet‘ that I’ve been posting to Shanghai Scrap by clicking here. In a couple of hours I’m departing for New York and the first legs of a book tour that will take me around the United States, the UK, China, Malaysia, and Singapore. Dates are still being added (and pins that announce “I never knew rubbish until I knew Adam Minter,” are still being printed), but you can find all confirmed appearances on my events page. It’s going to be updated frequently, so make sure to check back. And if you’re in the area of any of the appearances, make sure to stop by and introduce yourself as a reader of Shanghai Scrap. I’d love to meet up. Finally, at Goodreads we’re holding a US-only drawing to win one of five signed hardcover copies of Junkyard Planet (we’ll be holding international drawings as we draw closer to the January 14, 2014 UK release). See you on Junkyard Planet! During the run-up to the November 12 release of my first book, Junkyard Planet: Travels in the Billion Dollar Trash Trade, I’m posting photos taken during my decade of reporting on the global waste, recycling, refurbishment, and repair trade. Today’s Scene shows what many people in China (including a ranking government official whom I met today) characterize as “foreign trash” and many people outside of China characterize as “dumped” waste. Click to enlarge. To be precise, the image, taken two weeks ago at a scrap metal warehouse in Ningbo, China, shows scrap copper wire and tubing freshly unloaded from a shipping container that just arrived from the United States. I am talking about the copper pipe that used to send water flowing through your bathroom; the old telephone wire that once carried the voice of your best friend. Is it trash? This afternoon, in pursuit of an answer to this question I showed the photo to two scrap dealer friends of mine, and asked for a price. The consensus was that it’s worth around $3/lb at current market prices (for the professional scrapper crowd: minus twenty to twenty-five off the COMEX). Now consider the fact that there was 40,000 lb of this stuff in the container. That is to say, somebody sent roughly $120,000 worth of “foreign trash” to China. Of course, it’s entirely possible that somebody, somewhere in America, is willing to dump $120,000 worth of trash on China without any thought of being paid for it; but I’ve yet to find that person. 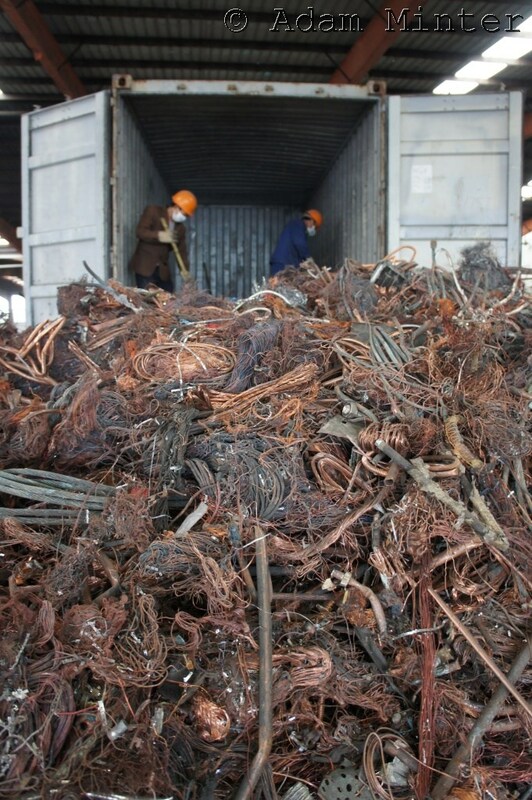 Indeed, according to data from China Customs that I received this afternoon, between January and September of this year, China imported 3.19 mmt of copper scrap worth $10 billion (the US was the leading exporter). Much of it looked like this – that is, it looked like foreign trash being dumped in Ningbo, China. But, of course, it wasn’t trash. It was something much more valuable that – if one can get past how it looks – makes the world a cleaner, greener place.